Attached are the results of our sight word implementation this past year. We provided 15 minutes of computer time on Monday, Wednesday, Friday from January to end of May with our second graders. These seventeen students all score at intensive levels on their January DIBELS (Dynamic Indicators of Basic Early Literacy Skills) oral reading fluency assessment. My hope was that the time spent with the sight words would transfer into an increase in fluency on their May DIBELS assessment. The children loved the sight word program and going for a full gold star was very motivating. 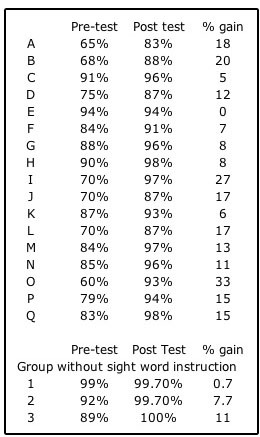 The average % gain from pre to post test for the 17 second graders was 13.64%. There is one Special Ed. student in this grouping (# A) who achieved an 18% increase from pre and post- test. I compared the fluency gains of the lowest 17 second grade title I students the previous year with the 17 title I students from this year who had the sight word curriculum. Words per minute gains in oral reading fluency from January to May on DIBELS assessments were compared. The previous average ORF gain from Jan. to May was 10.94 words per minute for the students without the sight word curriculum. This year's average gain with the sight word curriculum was 14.64 words per minute. This is not a controlled study, only a sample. However, based on the results and the highly motivating delivery, I will ask for an additional 10 minutes daily for sight word study to be added to our title I time. The Marks Manager was helpful to alert us when students were not doing the lessons in order. I would be interested in hearing what the % gain others have found using the sight word program. We will be using the Super Phonics 2 next year and I am currently looking for an assessment tool to diagnose specific areas needing support.